Wife Of Nobel Winner Tells Of Getting 'The Call' What is it like to get "the call" from the Nobel committee? Anita Laughlin learned how it feels when her husband Bob, along with two colleagues, won the 1998 Nobel Prize in Physics, there is no guidebook. So she wrote one..it's called "Reindeer with King Gustaf: What to Expect When Your Spouse Wins the Nobel Prize." Host Michel Martin speaks with Anita Laughlin for more. What is it like to get "the call" from the Nobel committee? Anita Laughlin learned how it feels when her husband Bob, along with two colleagues, won the 1998 Nobel Prize in Physics, there is no guidebook. So she wrote one..it's called "Reindeer with King Gustaf: What to Expect When Your Spouse Wins the Nobel Prize." Host Michel Martin speaks with Anita Laughlin for more. Now, here's a phone call you wouldn't mind getting in the middle of the night: from Sweden, from the Nobel Committee, telling you you've been selected to receive one of the world's most prestigious honors, a Nobel Prize. But what happens next? What do you do? What do you wear? What's it going to be like? As Anita Laughlin found out when her husband, Bob, along with two colleagues, won the 1998 Nobel Prize in Physics, there is no guidebook. So she wrote one. It's called "Reindeer with King Gustaf: What to Expect When Your Spouse Wins the Nobel Prize." And she's with us now. Welcome. Thank you so much for joining us. 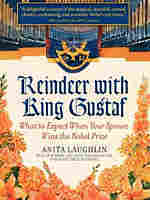 Ms. ANITA LAUGHLIN (Author, "Reindeer with King Gustaf: What to Expect When Your Spouse Wins the Nobel Prize"): Thank you. It's nice to be here, Michel. MARTIN: So your husband got the call at 2:30 in the morning. Or you - your family got the call at 2:30 in the morning. There's this very funny story about who actually got the call. And so would you just tell that story? Ms. LAUGHLIN: Well, my youngest son was sound asleep, and he has a Mickey Mouse telephone. And he let it ring for about half an hour and finally picked it up about 2:30 in the morning and came running into our bedroom and shook my husband's toes and said, dad, some guy from Sweden's on the phone. Can I go back to bed now? And my husband about screamed. And sure enough, he had won, and that started quite a crazy morning. MARTIN: So just a few hours later, you're in the thick of the frenzy. Would you mind reading us a short excerpt from the book where you talk about what happened next? Ms. LAUGHLIN: Yes, I would love to. By 5 a.m., there were white television vans pulling up in front of the house. Two huge broadcasting pipes wrapped with cables were laid out on the front lawn, along with several white dishes. People began pouring into the living room from all directions, reminding me vaguely of that house invasion scene in the movie "E.T.," carrying tall lights, miles of cables, cameras and microphones. Within 15 minutes, approximately 30 strangers were taking up stations inside and outside the house with commanding authority. The phone rang literally every 60 seconds. A female reporter said she needed two things: coffee with milk and a bathroom to do her makeup. So I sent her on her way and wondered if either of our teenage sons were about to get a pleasant surprise. Returning quickly, the reporter sat on the corner of the couch, plugged in her earphone and waited for her station's cue to begin interviewing Bob. Bob insisted he needed another tie, and we both bolted upstairs to find one. And the morning just continues getting crazier and crazier, and it was fun. MARTIN: Well, the thing that I found was funny is your sons were still asleep. That's what I thought was - you know they're two teenagers, right? Ms. LAUGHLIN: They were young teenagers, and we had so many people downstairs, and they never once knew they were down there. Ms. LAUGHLIN: No, that's true. MARTIN: �saying, you know, this is what you need. And I'm amazed by that. Ms. LAUGHLIN: You know, there's nothing glamorous like it here in the United States. If you look at the Academy Awards, that maybe comes closest. But there, the actresses all have their own dress designers, makeup artists, stylists. The jewelry stores loan them millions of dollars of jewelry to wear. In my case, you know, we kept getting these engraved invitations from the Royal Swedish Court that we were to have not one, but two dinners with the king. And, of course, that required evening gowns. And my wardrobe at the time was sort of vintage 1980 L.L. Bean, and my husband didn't own a suit. And, you know, physicists aren't known for their fashion sense. Ms. LAUGHLIN: So it was a pretty mortifying experience to try to guess what you were supposed to take. MARTIN: Can I ask you how many outfits you did wind up needing for yourself? Ms. LAUGHLIN: Yes. Well, for me, the Nobel week goes about seven days of receptions and dinners and balls and banquets and parties. So I ended up with three long evening gowns, which, of course, needed shoes, jewelry, all of that stuff. And I ended up with about four cocktail dresses, and you had to look right because you were photographed all the time. MARTIN: We need to take a short break, but when we come back, we'll continue our conversation with Anita Laughlin. She is the wife of Robert Laughlin, the 1998 winner of the Nobel Prize in Physics. Coming up: She'll tell us what it's like to have dinner with the king of Sweden, to sit next to him, in fact. That's just ahead on TELL ME MORE from NPR News. I'm Michel Martin. MARTIN: I'm Michel Martin, and this is TELL ME MORE from NPR News. Coming up, a newsmaker interview with Johnnie Carson, President Obama's senior diplomat in Africa. We plan to ask him about the latest news from the continent and about a fascinating encounter he had with Zimbabwe's longtime leader, some say dictator, Robert Mugabe. That conversation in just a few minutes. But first, we continue our conversation with Anita Laughlin. She is the wife of Robert Laughlin, the 1998 winner of the Nobel Prize in Physics. Winning the prize was a great triumph, but it also required a lot of work, and there was very little to go on in the way of guidance. So she set out to write a book about her experience: "Reindeer with King Gustaf: What to Expect When Your Spouse Wins the Nobel Prize." Anita, you and your family were invited to have dinner with the Swedish royal family after the Nobel awards ceremony. And do I have this right: You were seated right next to the king? Ms. LAUGHLIN: Unfortunately, I got to the palace with my husband, and I had this man with a staff come over and hit it on the floor, and he said - he whispered to me: You're going to be his majesty's dinner partner, so you need to get over to him right away so you can lead the hundred people into the room. And I sat to his right, and I had Jose Saramago, the literature winner, to my right, and he spoke only Portuguese. The man across from me was the chemistry winner, John Pople, but you couldn't see him because there was all this silver and candles and flowers in the way. So I couldn't talk to the man on my right or the man across from me, and I thought oh, my God, I've got to talk to the king. MARTIN: So what did you talk about? Ms. LAUGHLIN: Well, I finally got up enough nerve. I turned to him, and I said: Do you have any ghosts in this palace? And he looked at me, and he just loved the question. And he said, well, yes, as a matter of fact, in this room, if you look down at the end of the table, there's been a woman sighted in that window there by my staff many times. And he said, in fact, she died in here. Ms. LAUGHLIN: And that sort of broke the ice, and we talked the entire two hours, we talked. And I enjoyed myself tremendously. MARTIN: Oh, that's very nice. I'm so glad to hear that. You know, so how did your sons react to all this? As we mentioned, they were teenagers at the time. Todd was 13 and Nathaniel was 15. MARTIN: So were they impressed or just so not impressed? Ms. LAUGHLIN: They were mortified. I think they were so embarrassed, number one, they had to look nice when they left their hotel room. So most of the time they spent in their rooms, watching Bruce Willis on the "Armageddon" movie that was playing over and over and over, and they ordered hamburgers. So there would be trays and trays of hamburgers by their door, and if I could physically get into their room, we'd kind of try to find what outfits they were supposed to be wearing for wherever they were going. You know, they were completely shell-shocked, but they were old enough that they could kind of be on their own, which was lucky for us. MARTIN: What do you think they think about it now? Ms. LAUGHLIN: I think they're very, very proud because they understand the enormity of it and the fact that their dad did something that no one else could do. He had tackled a physics problem that everyone else said couldn't be solved. And the prize has enabled us to do a lot of traveling around the world with the boys, which has been fantastic. So I think it's almost opened up the world to them in a way that wouldn't have happened before the prize. MARTIN: And that was going to be my next question, which is: How has the prize changed your lives? Ms. LAUGHLIN: It has put Bob on a world stage in a greater way, and sort of by default, the rest of us experience that in some way. I think in terms of our families, it's like a domino effect is the only way I can describe it, that the sort of pride of this accomplishment dominos through your entire extended family. And in any other way, I don't think it's changed us that much, except that Bob has a lot more visibility and he, his opinions are sought after a great deal more. MARTIN: Well, how has it changed your life? Ms. LAUGHLIN: I think, as I mention in the book, I had been married to Bob for 20 years when he won and I knew him very well as a husband and father. But in the past 10 years or 11 years, I've gotten to know him more as a scientist. And I feel like I'm sort of more connected him now, like I've seen the whole person. I feel I'm really almost starting to get to really know him and it's a fun relationship. It really is. MARTIN: Anita Laughlin is the author of "Reindeer with King Gustaf: What To Expect When Your Spouse Wins the Nobel Prize," which is exactly what the book is about. Her husband Robert won the Nobel Prize for Physics in 1998 and she joined us from the studios at Stanford University where he continues to physics. Ms. LAUGHLIN: Oh, thank you, Michel. I've enjoyed it. Twenty years after our first date, on October 12, 1998, the director of the Stanford News Service called Bob at his office to inform him that he was on an "even shorter list" of possible recipients to win a Nobel Prize, and that Bob was to call him immediately if he heard anything. Bob promptly threw the phone number away, believing that Stanford could not possibly win a third year in a row (Steven Chu 1997; Doug Osheroff 1996). But early in the morning of October 13, the phone rang repeatedly in our son Todd's room. As a hip thirteen-year-old, Todd had a large, trendy Mickey Mouse phone in his bedroom, which, I will remark, is a good deal larger and more colorful than the iPhone he now carries. Todd shuffled sleepily into our dark bedroom, jiggled Bob's toes, and said: "Dad, there's some guy on the phone from Sweden. Can I go back to bed now?" Bob sat bolt upright and groped for the phone in the dark. We had turned off the ringer the year our sons both hit adolescence. I heard Bob reply to the caller slowly and calmly. "This is the best kind of news," he said quietly. Bob then conversed with two Swedish colleagues, Mats Johnson and Stig Hagstrom. They were on the physics committee in Stockholm and were reassuring Bob that this was not a prank. It was the real thing. Todd stood motionless. I began to sob as Bob hung up the phone. We embraced and Bob leapt up to tell our other son, fifteen-year-old Nathaniel, who had slept through the whole incident. Bob searched the waste-baskets for the News Service's business card. Todd asked me why I was crying and then announced that he was going back to bed. I found out the next morning that he had actually allowed the phone to ring "a long time, maybe half an hour. I wanted to be asleep!" His Mickey Mouse phone was later photographed when he was asked a half dozen times to retell his story. The Nobel archives expressed an interest in having the phone, but Todd wanted to retain his "piece of history." Bob decided to wake up his department chairman, Blas Cabrera, and asked him to call the News Service. This was at around 2:50am Bob awoke both his mother, Peggy, and my mother, Carolyn Perry, with the same question: "Want to go to Stockholm?" The screaming at the other end was audible across the room, and at least in my mother's case, went on for twenty minutes. My father thought she'd won the lottery. I turned on the porch lights just as the phone began to ring off the hook. Bob was now very awake and in various stages of undress, talking, and shaving. I searched hard to find him a tie, clean shirt, and blazer. As these items were the extent of his "wardrobe," he dressed quickly. I went down to make him some French roast coffee and toast. He was unable to walk across the room without hearing the phone ring. The prize had been announced at 6:00am eastern time, and 3:00am west coast time. At 3:30am, an intrepid Jack Hubbard from the Stanford News Service knocked on the front door. With remarkable trust, because I was still in my bathrobe, I let him in. He was immaculately dressed. He asked where the phone was, tossed his own cell phone on the desk, and explained: "I am here to get you through the day. I am here to answer the phone, set up newspaper interviews, be Bob's bodyguard and chauffeur. We need to keep him calm and not let things get overwhelming. I take my cues from you on this." Great, I thought. Calm cues. Right. I ran frantically upstairs and threw on a generic denim tent dress that was the best I could do at 4:00am. The boys were resolutely asleep. I peeked into Nat's room and said: "Nat, your dad's won the Nobel Prize!" "Oh, yeah, I knew that. Good night." Within a minute, Jack's assistant appeared. He was a jovial older man who was also helping with phones and prioritizing media interviews. By 4:30am, an hour in which I have never actually been awake, I threw some cinnamon buns in the oven and began to scramble eggs as people kept arriving, all congregating in the kitchen. They began taking pictures all over the house. One photographer was taking pictures in the kitchen. "You want pictures of scrambled eggs?" I inquired. "Oh, certainly," she responded as my eggs then appeared on her laptop screen. "I push this button," she said, "and your eggs get digitally transferred to newspapers all over Europe. Everyone in the world now knows you're eating eggs for breakfast." "Great," I choked and ran upstairs looking for another dress. By 5:00am there were white television vans pulling up in front of the house. Two huge broadcasting pipes wrapped with cables were laid out on the front lawn along with several white dishes. People began pouring into the living room from all directions (reminding me vaguely of that house invasion scene in the movie E.T.) carrying tall lights, miles of cables, cameras, and microphones. Within fifteen minutes, approximately thirty strangers were taking up stations inside and outside the house with commanding authority. The phone rang every sixty seconds. A female reporter said she needed two things: coffee with milk and a bathroom to do her makeup. I sent her on her way and wondered if either of our sons was about to get a pleasant surprise. Returning quickly, the reporter sat on a corner of the couch, plugged in her earphone, and waited for her station's cue to begin interviewing Bob. Bob insisted he needed another tie and and we both bolted upstairs to find one.